On our Front Table this week, find explorations local, global, and beyond: from the ferment of South Side creative energy in the 60s and 70s and the storied career of a Chicago political reformer, to a global dictionary of communicative gesture, to multidisiplinary projections of humanity as a multiplanetary species. Browse the following titles and more at semcoop.com. Gestures convey meaning with a flourish, and often speak louder than words. Yet the same gesture may have different meanings in different parts of the world. What Americans understand as the "A-OK gesture," for example, is an obscene insult in the Arab world. This volume is the reference book we didn't know we needed: an illustrated dictionary of 850 gestures and their meanings around the world. Organized by body part, from head to foot, it catalogs voluntary gestures made to communicate openly and explains what the gesture conveys in a variety of locations. Illustrated with clever line drawings and documented with quotations from literature (the author, François Caradec, was a distinguished and prolific historian of literature, culture, and humorous oddities, as well as a novelist and poet), this dictionary offers readers unique lessons in polylingual meaning. In 1948, Abner Mikva, fresh out of college, volunteered at the 8th Ward Democratic headquarters in Chicago. This was the beginning of a storied political career that would eventually take him to the Illinois Statehouse, the US House of Representatives, the DC Circuit Court of Appeals, and the Clinton White House - culminating in a Presidential Medal of Freedom awarded by a young politician he had mentored, Barack Obama. At eighty-seven years old and in declining health but as wise and wry as ever, Mikva sat down with his former speechwriter and longtime friend Sanford Horwitt for a series of conversations on life, politics, and the history that Mikva saw firsthand. Conversations with Abner Mikva lets us listen in as the veteran political reformer and unreconstructed liberal reflects on the world as it was, how it's changed, what it means, and what really matters. When the aspiring young writer Andrzej Bobkowski, a self-styled cosmopolitan Pole, found himself caught in occupied France in 1940, he recorded his reflections on culture, politics, history, and everyday life. Published after the war, his notebooks offer an outsider's perspective on the hardships and ironies of the Occupation. In the face of war, Bobkowski celebrates the value of freedom and human life through the evocation - in a daringly untragic mode - of ordinary existence, the taste of simple food, the beauty of the French countryside. Resisting intellectual abstractions, his notes exude a young man's pleasure in physical movement - miles clocked on country roads and Parisian streets on his trusty bike - and they reveal the emergence of an original literary voice. Bobkowski was recognized in his homeland as a master of modern Polish prose only after Communism ended. He remains to be discovered in the English-speaking world. Cathay is a collection of Chinese poetry translated into English by modernist poet Ezra Pound. It helped establish a modern style for American literature, and at the same time created a thirst for classical Chinese poetry in English. Yet Pound wrote it without knowing any Chinese, relying instead on word-for-word "cribs" left by the Orientalist Ernest Fenollosa. This fully annotated critical edition focuses on Pound's astonishing translations without forgetting that the original poems are masterpieces in their own right. By placing Pound's final text alongside the poems it claims to translate, as well as the manuscript traces of Pound's Japanese and American interlocutors, the volume resituates Cathay as a classic of world literature. In addition to the Chinese poems, the volume also includes Pound's famous translation of "The Seafarer" from Anglo-Saxon, as well as fifteen further Pound translations from Chinese and his essay "Chinese Poetry." This landmark edition will forever change how readers view Pound's "Chinese" poems. Thursdays and Every Other Sunday Off is an exploration of the lives of African American domestic workers in cities throughout the United States during the mid-twentieth century. With dry wit and honesty, Vertamae Smart-Grosvenor relates the testimonies of maids, cooks, child care workers, and others as they discuss their relationships with their employers and their experiences on the job. She connects this work with popular culture, presenting Aunt Jemima, Mammies, Uncle Ben, and other charged figures through the eyes of domestic workers as opposed to their employers, and remembers her own family history (her mother and grandmother were domestic workers after migrating to Philadelphia from South Carolina). Now back in print, Smart-Grosvenor’s masterful book is an intimate and heartbreaking tapestry of interviews, history, news reports, personal anecdote, humor, and critical observations on the nature of racism. We now have the technology to reach nearby planets. Even though many long-term technical issues still need to be resolved to create the conditions for a permanent, self-sustaining human life on another planet, imagining humans as a multiplanetary species is no longer merely the stuff of science fiction. 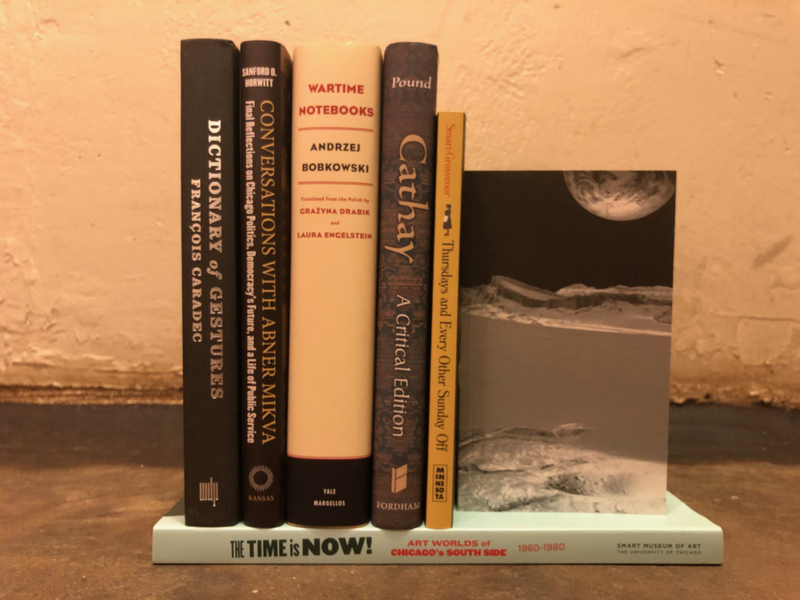 Against this backdrop, Planetary Echoes considers the place of this dream of human life on other planets in the arts, literature and sciences at the beginning of the 21st century. In this volume, a broad, interdisciplinary list of contributors (scientists, astronauts, designers, philanthropists, inventors, and artists) weighs in on the imaginable possibilities of space settlement. By offering a deeper insight into what is possible today, Planetary Echoes aims to inspire readers to participate in the collective dream of space exploration. At the same time, it pairs the drive to explore with the most urgent existential question of the 21st century: saving the Earth's future. Edited by Rebecca Zorach and Marissa H. Baker. During the 1960s and 70s, Chicago was shaped by art and ideas produced and circulated on its South Side. The Time is Now! Art Worlds of Chicago's South Side, 1960-1980, published in tandem with an exhibition at the Smart Museum of Art, examines this cultural moment, its figures, and its legacies. It focuses primarily on African American artists and examines watershed cultural moments: from the Wall of Respect to Black Creativity, from the Civil Rights Movement to AfriCOBRA, from vivid protest posters to visionary Afrofuturist art, and from the Hairy Who to the radical sounds of the Association for the Advancement of Creative Musicians. The book reassesses traditional narratives of postwar Chicago art and resonates with current national dialogues around race, gender, protest, and belonging. It contains a series of long and short essays, interviews, and other contextual material, along with full-color images of all works included in the exhibition and extensive reproductions of ephemera and historical photographs.